This past Monday evening was a long evening, another night of fever watching all night. Thankfully she had her line already accessed so this fear of going to the hospital would not be because of the line needed to be accessed. We ended up making it through the night with at one point it was surely high enough to go in, but it ended up going back down. Tuesday morning, it was 100.5, so we brought her in not wanting to mess with this in case the cold was causing this or even worse something else or even becoming septic. No fever in the clinic, however she had low blood pressure with a high heartrate anywhere from 130s to 160s, Emily’s normal heart rates is 100 – 110. So, they went ahead and gave her mirapenum (spelling) for antibiotic and a bolus of fluids. The bolus was in hopes of getting her blood pressure normal and heartrate normal, however it did not. So Emily was sent for an xray to look at her chest because of the coughing and then off to be admitted. Being brought to the 7th Floor as inpatient flooded us with memories of when Emily was first diagnosed and then all the times after that she was admitted. It was almost as if things didn’t change, except for a few new nurses, a few new doctors and patients of course and then some of the patients were ones we had seen before. It was so hard to see her there, and like she did before she cried wanting to go home, because she didn’t want to be there. I really wanted to cry with her and thought this was no place for her. The childlife left a few gifts on the bed for Emily of the Little People Camper with a car and some hair stuff and socks. How awesome is that, and she just guessed on the camper stuff. Emily loves camping, so she loved the toys. Thank you ChildLife!! 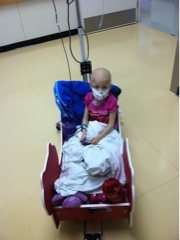 After getting into the room, Emily was ready for me to pull her in the wagon around the halls with her mask on. We strolled the 7thFloor halls for 3 hours and after those 3 hours, my legs were on fire. Not many places to walk, so we continued to see the same people over and over again and some of the nurses even tried to get Emily to talk, but she wouldn’t. Dr Massey came in and said that her xray was clear, which was an awesome thing, don’t want to bring an added worry! All night she continued to have no fever, she continued with her megace and nifurtimox and she was trying to eat a little bit. The nifurtimox did bring a bit of a problem in a hospital that does not allow FDA approved things. The nurse said that the pharmacy was coming up to take the nifurtimox to put their label on it. I was not thinking in the "FDA approved" thought, I was thinking about Emily's low counts and having this go out of my sight and who knows whose hands it would be in and Emily get sick after that taking them. So I wouldn't allow it to leave my sight. (Come to find out later, it was a good thing we didn't give it over because our nurse in the clinic said we may not had gotten it back since VCU doesn't allow non FDA drugs.) Daddy brought Brianna and Jessie up for dinner and I took the girls downstairs to eat while Daddy spent some time with Emily! When she was ready for bed, we laid down and the coughing got worse and worse. I finally went and talked to the nurse, telling her how dry it was in the room, was there anything we could do. She made a makeshift humidifier to put some wetness in the air, and within the hour Emily was able to fall asleep and stopped coughing as much. Labs were drawn early and the doctor walked in early, telling me that Emily’s hemoglobin was 6.4 and that she would need blood. This was the lowest it had ever been before, since we have started treatment, so of course we were on board to get some blood. This probably was also the cause of the low blood pressure and high heart rate. Thankfully the blood didn't cause any problems and also she didn't have any fevers throughout the day. The doctor came i at 2pm and asked if we would want to go come if the cultures that would be released around 4ish came back negative. UM HECK YEAH, we would love to go home. 415 PM came around and she was ready to go home, so we packed up and were out of there around 445PM. Emily was happy to be leaving, she wasn't up to her 100% self, but she was getting out of there. She had to be back Friday for clinic to check her counts and see where here platelets were since they were pretty low before leaving. Next day Emily was back to herself just still full of coughing, but happy and talkative. Friday's clinic brought still neutrapenic and platelets needed. Emily will go back Tuesday for counts, her nurse feels she will probably need blood, hopefully not because this means a long day in the clinic, but at least she will be prepared for flight. She will be accessed and not have to do that when we get there, and be ready for injection of the MIBG isotope. Wings of Mercy, such a wonderful organization will be picking us up Wednesday morning about 730AM as we are off to Michigan with a rental car waiting and we will be staying in the Renucci House and then bringing us back Friday morning being back around 1ish. We were able to work it out that Brianna could come with us on the flight, which before she was not able to. Jessie will be at her dad's so she doesn't miss school and dance for 3 days. I will try to keep you guys up to date on whats going on and how things are. Next week brings about scans and lots of anxiety, therefore scanxiety. While her HMA/VMA levels are low, it still brings the fears that we don't want or even that this isn't working. These scans are bringing more anxiety than we have had in the past, just because we want to know where we are going moving forward, whats next. Our hope is that Dr. Sholler says she is seeing an amazing decrease in the spots and would like for Emily to continue on the trial. (this trial is for at least 6 rounds). While we don't want to continue with more chemo, if this is working, we are happy to get the cancer out of her and continue on along with the nifurtimox. This past week we lost a special fighter, Krysten. Krysten is a beautiful 18 year old bright blue eyes fighting neuroblastoma, she is no longer fighting and is now cancer free. Please leave her family love and thoughts on her obit, Krysten you will always be in our thoughts, we will miss seeing you in the clinic. Continue to keep your love and thoughts for Emily as we continue to fight neuroblastoma with Emily and bringing her cancer free! Make sure you hug and love your kids and tell them everyday how much you love them! Oh, my heart is just breaking for you all. Cancer just totally stinks! Hang in there and keep your eyes on Jesus, He will help you through this. Praying and praying for good results on these scans. Praying for you all. We've had the same virus here, my husband and I, and 3 of the girls. The hubby and the children were over it in 1 week - 10 days. I'm still down with it (3rd week) but it's because I'm pregnant. It's morphed into asthma like symptoms for me now. Hope she gets over it quickly!